Classic of American anthropology explores messianic cult behind Indian resistance, from Pontiac to the 1890s. 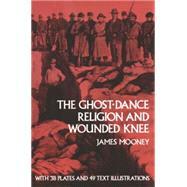 Extremely detailed, thorough account, citing many primary documents as well as Mooney's own anthropological data. Originally published in 1896 as Part Two ofBureau of American Ethnology Report XIV. 38 plates, 49 other illustrations. "Ranters, Quakers, and Fifth-Monarchy men"
1. "Opening song: Eyehe´! nä´nisa´na - O, my children!" 11. "A-ni´qu wa´wanä´tia´ - Father, now I am singing it"
12. Ha´yana´-usi´ya´ - How bright is the moonlight! 15. "A´he´sûna´nini naya´qûti´hi - Our father, the Whirlwind"
16. "A´he´sûna´nini naya´qûti´ - Our father, the Whirlwind"
28. "Ani´qu ne´chawu´nani´ - Father, have pity on me"
40. "Iyu hä´thäbe´nawa´ - Here it is, I hand it to you"
41. "Hanae´hi ya´ga´ahi´na - Little boy, the coyote gun"
47. "Häi´nawa´ hä´ni´ta´quna´ni - I know, in the pitfall"
57. "Ani´qa he´tabi´nuhu´ni´na - My father, I am poor"
60. "Ga´awa´hu - The ball, the ball"
17. "A´ga´ch ehe´e´ye´ ! - The crow, the crow"
18. "Nä´niso´näsi´stsi he´e´ye´ ! - My children, my children"
"The Paiute, Washo, and Pit River tribes"
5. Pägüinäväi - Fog! Fog! 2. "Michi´nkshi nañpe - My son, let me grasp your hand"
3. He tuwe´cha he - Who think you comes there? 15. "Ina´ he´kuwo´ - Mother, come home"
18. Mi´ye wañma´yañka-yo! - Look at me! 22. "Michi´nkshi tahe´na - My child, come this way"
24. "A´te mi´chuye - Father, give them to me"
"The Wichita, Kichai, and Deleware"
15. "Wi´tu´ Ha´sini´ - Come on, Caddo"